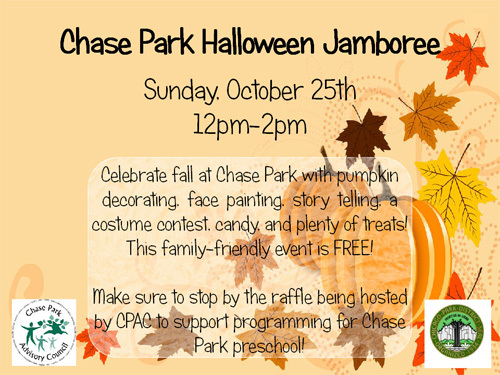 Don't miss the annual Halloween Jamboree at Chase Park! This fun, family-friendly event includes lots of treats. Stop by for pumpkin decorating, face painting, storytelling, a costume contest, and more. This event is FREE. Raffle tickets will be available for purchase for a variety of items, with proceeds benefiting programming for Chase Park Preschool.